Lemonade Makin' Mama: It's really all about the peanut butter sauce. As promised, I've got a killer recipe to share today. One that I worked into our food budget to boot! One of my sis-in-laws has a birthday all smushed up next to JJ's birthday and it often works out that we celebrate them together. Which hardly seems fair. So my Mama and I put our heads together and I suggested that we surprise her with cake on a day when they would be helping my parents with some house repair jobs. My Mama suggested an ice cream cake since my sis-in-law isn't the biggest fan of cake. I am sorry that I didn't photograph the first few steps of this cake. I wasn't thinking. Begin by letting a half gallon of chocolate ice cream soften. Then scoop and spread it evenly into a spring form pan. Next, layer chocolate sauce or cold fudge sauce. (I had chocolate sauce so that's what I used, but I would do it with fudge next time, since it holds it's shape and doesn't run all over. Then again, there's something kind of endearing about chocolate sauce running all over the place.) I dropped a bunch of peanut butter cups face down into the chocolate sauce layer and froze it all overnight. The next layer was a half gallon of softened vanilla ice cream scooped, smoothed, and frozen til solid. *Combine all into saucepan and whisk until smooth and creamy. Let cool at room temperature and it will thicken slightly. Now spread half the cooled peanut butter sauce over the ice cream cake. Put the other half into a piping bag and cut just the tip off. Scoop ice cream scoops with a mini scooper and place onto a lined baking sheet. Quickly drizzle the peanut butter sauce over each mini ice cream scoop and get into the freezer for another hour or two. Place all the mini scoops on top of the peanut butter sauce layer, and sprinkle with a few chopped up peanut butter cups. Carefully run a knife around the inside edge and pop the spring on the spring form pan. With a little wiggling, it should slide right off. Slice and enjoy! They make the most adorable wood signs here.... if you haven't seen them, you should go check out their shop! I'm blown away by this ice cream cake and your endless amount of talent and energy! Blessings! You never cease to amaze me. That cake looks amazing & I am totally loving her new sign. Blessings! Oh my! I am literally drooling over those photos! This is going on my list, possibly for Easter! OH MY WOW!!! Carry on, if you can:) WOW! This is the most beautiful thing ever. I'm drooling. That ice cream cake looks fabulous and the mini ice cream balls are even cuter. Your hubby is not a freak....my husband doesn't like peanut butter either..LOL, but if you lace anything with ice cream, he just may eat it. HA! Oh beautiful,I want some now! OH MY WORD! 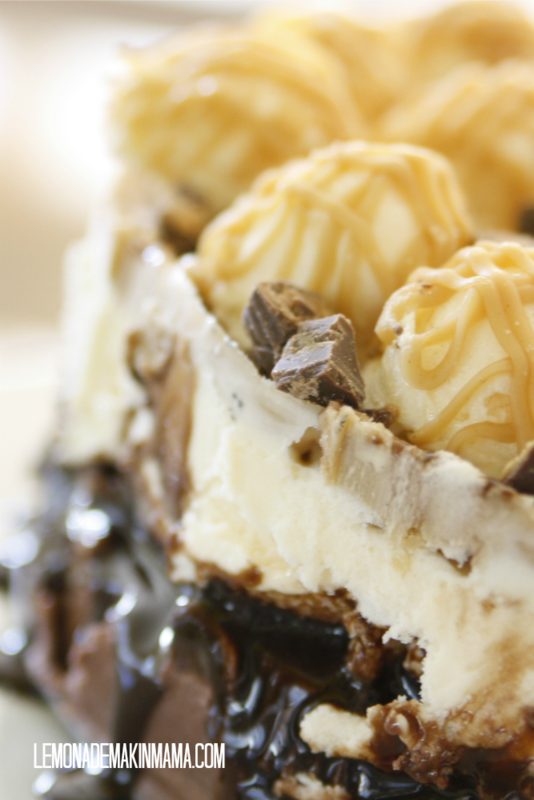 The ice cream cake is a thing of beauty and sounds delish too! You have the best ideas. And what a precious sign for your sweet girl. and a tsp of vanilla. Then simply pop in a cake tin into the freezer, and soon will be ready. Tip: I grease the pan and line with glad wrap (cling wrap) makes for easy removal. I think you need a book like "Where Women Create" - "Where Shasha does it all" LOL - You are amazing - cooking, sewing, running - SUPER WOMAN :) Have a blessed week. uhhhhh....its 8 a.m. and i want ice cream cake. like right now. You hit another one right out of the park!!!! I agree with Sheri up there about a book :) I'd read it, more than once!!!! Okay, your man is not a freak for not liking peanut butter. I don't like it either! My boys and husband love it and so I make things with it occasionally even though the smell makes me gag. I will say that your cake looks good! We make one with ice cream sandwiches and the caramel/chocolate sauce or hot fudge & your favorite candies and then cool whip on top with more toppings on top. Yum! I MUST come up with a reason to make this (and put it in our very tight grocery budget this month). Oh. My. Yes. It looks AMAZING!!! I make a homemade Dulce de Leche (a favorite Argentine carmel sauce). My hubby isn't a big fan of Peanut Butter desserts, but I'm sure he would like it if I made it with Dulce de Leche instead. Okay YUM! I need to try this when Lent is over. (We gave up sweets.) Is it more like a cake or a really yummy doctored up ice cream? Either way it looks amazing and is so pretty! I like how the chocolate is going down the sides. So pretty! I'm in the same boat as Christina. Forgive me for skipping over most of this post...looks scrumptious! I LOVE the adorable sign for your little doll's room. I think my little doll would love it too. Might just have to take a look at the website. :) Thanks for sharing.